The way students interact with O’Donnell could not be written off as your average teacher-student relationship. 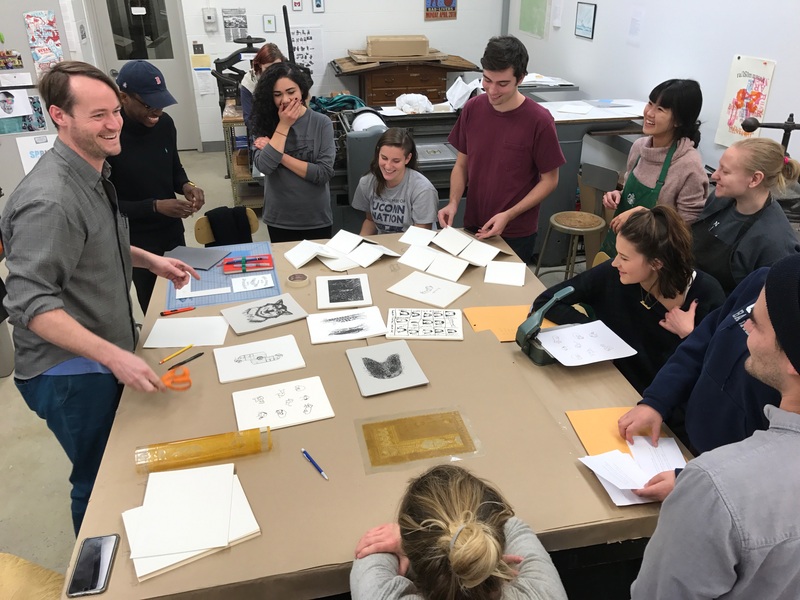 John O’Donnell, a printmaker and new media artist, is an Assistant Professor of Printmaking at UConn. He utilizes traditional and experimental techniques to address topics such as illusion, construction, failure and nostalgia. Whether through prints, paper, performance, or video, O’Donnell is able to captivate any observer. The way students interact with O’Donnell could not be written off as your average teacher-student relationship. There was an inexplicable ease in the way students chatted with him, exemplifying an openness that many of today’s teachers can implement themselves. Q: What gravitated you towards art? A: I don’t remember this personally, but it’s one of my Mom’s favorite stories. I was really young, maybe one and a half or two, and I drew a toy dinosaur that was in front of me with some crayons that were out. My mom knew I was going to be an artist one day, and she kept giving me art supplies all the time after that. As my life went on, I realized I was always doing art and always had different little projects I was working on. As a kid, I was always doing something that was performative or entertainment based. I had my own radio show, where I would go around and interview all the kids in my neighborhood with my portable microphone and listen to it on my tape player. I would organize plays and things like that. Then when I got to college, I didn’t think I was going to study art because I figured I was just gonna do it anyway. I start studying philosophy, until I realized I’m not very good at philosophy. I’m good at art so it would be silly for me to be a “philosopher.” I always knew that I wanted to teach because I always loved my art teachers. I just love to hear people talk and I always want to be a part of that overall conversation. I have a lot of pride in the University of Connecticut … I feel like it’s a really natural extension of my whole educational experience to be lucky enough to teach here. Q: How did you end up teaching at UConn? A: I went to graduate school at UConn from 2005-2007 and completed my MFA. Then I spent a lot of time working around the state at different colleges and universities and working at a state agency, assisting management of artist grants and public art commissions. I also worked in the non-profits sphere for a little while, and through that process decided I really want to pursue teaching. It was one of those fortuitous moments – in the right place at the right time with the right resumé. I have a lot of pride in the University of Connecticut because my education here was so great. I feel like it’s a really natural extension of my whole educational experience to be lucky enough to teach here. Q: Are any of the same professors here that you worked with? A: Yes. When I first started working here, I was really sensitive and hyper aware of my position within the hierarchy because in a lot of ways these people watched me have my diapers changed as a grad student. People in your family always remember you when you were a toddler, and you weren’t even self-aware. So many of these people that I currently work with knew me when I was a 25-year-old, optimistic, wide-eyed, ambitious grad student. I’m sure they don’t think I changed very much, or maybe they do, but I feel like I’m a completely different person. It’s interesting to be back in this context as an adult. I spend a lot of time listening to students to see how I can balance their expectations with my requirements, their interests with my interests. Q: Could you tell me about your teaching technique? A: I have a plan, but I really let the student conversation guide me. I’ve even had an entire semester concept plan, and an hour before the first day of class – just because of a conversation I had with another co-worker and a student in the hallway, I completely changed everything. I just spend a lot of time responding intuitively to what the environment is offering me. I spend a lot of time listening to students to see how I can balance their expectations with my requirements, their interests with my interests. A lot of the teaching is quite a bit of a conversation with my students. A lot of it also is making sure they have enough personal and mental space to feel confident in their ability to develop. I think sometimes I work like a tour guide rather than a personal trainer. I offer things to be consumed or considered, and then I use what they choose as a guide for the way that the class continues to progress. Sometimes a class concept or structure will immediately change given the dynamic I have with the students – sometimes on the first day and sometimes later on in the semester. Just to boil it down, I really like listening and finding out what people are interested in and then moving in that direction. I never want to be the type of teacher that is really prescriptive or authoritative in the wrong direction. I like to listen and feed off of what they offer in addition to what I offer them. Q: Do you keep in touch with past students? A: Absolutely. I do stay in touch with quite a few students. It’s always fun for me because often times I’m surprised by former students at my openings. With social media, it’s so much easier to stay in touch with everyone. It’s really fun to see where they go and what kind of things they accomplish, which I’m always impressed with. I think UConn has a good track record for producing some really amazing artists. It’s kind of easy to keep tabs on people because so many are so visible. I strongly believe that there can be little things that you suggest or put into the world that people will respond to if they choose to reflect. Q: You make a lot of powerful statements with your artwork. Do you hope your art changes the way people think? A: I want to make people look at things slightly different. I’m not gonna blow the roof off of anyone’s ideological wheelhouse or anything like that. I strongly believe that there can be little things that you suggest or put into the world that people will respond to if they choose to reflect. I don’t do anything too overbearing, sometimes it’s a little bit verbose or a little bit loud, but sometimes I just do subtle things. For example, a project I’m working right now are bumper stickers that say “your crazy.” This is a bumper sticker that’s designed to offend everyone – people that are obsessed with grammar or preoccupied by the proper usage of the English language would be immediately offended by the wrong use of “your,” but someone that might not be preoccupied with language would actually find this offensive that someone is calling them crazy. This is one example of something kind of subtle, it’s nothing too authoritative, but it’s one of those things that you get from it what you want. Some of my work is more about philosophical ideas, imagination, and inventions. In terms of my most recent stuff…this election has caused me so much more distress than I anticipated it would. I guess I haven’t been faced with something so severe in a political climate. It’s scary to me and many people that I care about. [Winners are losers] was my most political statement. It had to be made in the moment because I was feeling an absence of understanding. I’m a big fan of saying the right thing at the right time and I feel like it was the right time to say something. I had a lot of ammunition I have been holding onto by looking at the economics in America, all the inequality, and the different ways that that’s expressed. It was the right place, right time, with the right amount of frustration the right venue and so it was really an important appropriate context for me to flex my political muscles. Unfortunately, the language that most of the world uses is a money based language. Being an artist or an educator, we fall by the wayside of that conversation. Q: The Winners are Losers piece is obviously very relevant with the current political climate. How did Dave and Busters tie in together with that? A: I’m interested in what it’s like to be an American and how that definition is constantly changing. I also find a certain amount of frustration with the economic climate, specifically the current one because it’s the one I’m most familiar with. I just feel that too much emphasis is placed on people’s financial worth. So many people’s identities are wrapped up in how much money they have or what kind of things they have. I feel that Dave and Busters is almost like an analogy for that whole experience. When I go to Dave and Busters, it’s one of those things where I want to critique America but I’m an American, and I want to critique Dave and Busters, but I enjoy Dave and Busters. The reason I would gravitate towards Dave and Busters as a way of understanding the American economy and the identity that’s wrapped up in it is how people acquire things at Dave and Busters: you trade your money in for credits on a card, you turn that card into tokens, you turn those tokens into tickets, and then you turn those tickets into prizes. The prizes themselves you can only win through this process, and I feel a mortgage is the same thing. You turn your time into money, turn your money into savings, turn your savings into credit, turn credit into a mortgage, and then you turn that house back into another possession or another way of building credit for the next thing. I feel like we’re always just cashing in things to get the next thing. By doing that at Dave and Busters, it allows me to fast-forward that process and have an accelerated, high fructose version of that. I find it interesting because my financial awareness is something I question about myself a lot. I’ve always lived in an art world, where I spend a lot of money on things that won’t make me money but will provide me with a lot of emotional and intellectual satisfaction. I do have friends that are dedicated capitalists and that’s their art. It’s interesting to hear people talk about money in the same way that I talk about art. Unfortunately, the language that most of the world uses is a money based language. Being an artist or an educator, we fall by the wayside of that conversation. The things that we invest in might not be as important as to society as it should be. It’s still important that we maintain that commitment because it does have value, it’s just not a quantifiable value. I’m only alive for such a short period of time, that I don’t ever want to have my worth determined by zeros in my bank account. I guess the whole thing about going to Dave and Busters is that I kind of can relate to the people that do live their life with this economic focus. Once you boil it down, I understand the experience of acquiring things can be satisfying; however, I have always been such an idea based, emotional, romantic person, that I don’t want to have money be my focus all the time. Dave and Busters helps me understand what it’s like to be a person in this economic culture. Dave and Busters becomes this weird condensed petri dish of that whole economic experience. When I leave Connecticut I feel very vulnerable, and it’s probably because I’ve been a snotty, intellectual, artist brat ever since I was born. Q: Some of your pieces explore the idea of being American. Could you talk more about that? A: Just behind you there’s a State Fair of Texas guitar, and that motivated me. I’ve gone to the State Fair of Texas a couple times, and it’s the largest state fair in America. What better way of understanding what America is all about. The State Fair of Texas is incredibly diverse. It’s all under the umbrella of Texas, and I feel Texas is so parallel to America in its largeness. It’s this idea that when I’m sequestered in Connecticut, which ultimately I consider to be an incredibly privileged location, it’s such an odd, safe, sheltered place. It’s afforded me so many opportunities, that I just feel privileged to be where I am. Some of that is tied in with Connecticut and not America, but New England. When I leave Connecticut I feel very vulnerable, and it’s probably because I’ve been a snotty, intellectual, artist brat ever since I was born. I feel a certain amount of comfort here but going to Texas is fun way to step out of myself. I’m just reflecting on this idea of being American more and more as I get older, and as I become more sensitive to the political climate. I owe it a lot to my students. I’m at least 15 years older than my students, which isn’t a lot so I’m really absorbing a lot of their culture, and it’s making me reflect on my culture. I like the smart, forward thinking, progressive minds that are 18 or 19 years old. They’re worlds above where I was when I was their age. It’s really inspiring me and offering me the opportunity to reflect on what that’s all about. We spend so much of our time almost making fun of the art of the present and worshiping the science of the present, but when we look back at civilization – we worship the art and dismiss the science. Q: Hollow Earth was one of your pieces that played around with scientific theories and art. What was your inspiration? A: Antique science, where so much of science was imagination plus philosophy and assumptions. I’m interested in the whole different ways we come to understand ourselves in the world and how that’s always evolving. It’s this idea of science vs. art, which is something I’ve been kinda preoccupied with lately. We worship art from the past, we love greek statues, roman architecture, and cave paintings, but we laugh at science of the past. ‘Can you believe people thought the Sun revolved around the Earth? That’s stupid. Can you believe people didn’t know what germs were?’ We spend so much of our time almost making fun of the art of the present and worshiping the science of the present, but when we look back at civilization – we worship the art and dismiss the science. It’s something I think about all the time. There’s something very different about art and science, but something very similar at the same time. Q: There’s a performance aspect to your art as well. How do you feel during your performances? A: The first time I did a performance was at a gallery in Chelsea, New York after graduate school. I felt such an incredibly exhilaration once I was done. I noticed that the entire gallery of 50-60 people were watching me, and I didn’t even care. For the first time in my life, I could understand what an athlete feels like, when they’re in the zone and they’re focused on what they’re supposed to be doing. As a child, I was a really precautions kid. I would get really self conscious that everyone was watching me whenever I played a sport; however, after doing that art performance, I felt really free in that moment. After that first performance, I knew I was going to do performances for the rest of my life. It’s almost like you’re in a different world, completely absorbed in your own actions. Even though everyone’s watching, it doesn’t matter because it’s almost like second nature – you’re going to become who you are in that moment. What I like about performance, and it’s kind of a silly statement, but “it is what it is.” It exists in that very moment, a video of a performance is never really interesting. For everyone that’s there in that moment, they get to experience something totally unique that will never happen again, and so do I. It’s really special, especially in today’s world, where everything is recorded or live stream, only existing in a digital context.